Like most Israelis, I have dear friends living very close to the Gaza border. Some have, yet again, been forced to spend nights in bomb shelters with their children; others don’t have a shelter in their apartments and so rush to safety at the sound of a siren. We have lived on this roller coaster too long to expect any real peace in the near future. The questions are always the same. Why are we fighting yet again? Why don’t we do what needs to be done yet again? And in frustration, I ask, why do the Palestinians never learn from their mistakes? But then again, why don’t we? No matter what happens this summer, in three years or four, we’ll be right back where we are now. This is a recurring nightmare for all of us here in Israel. The first time, it was in the middle of winter and my son was called to the front. For several weeks, I lived the nightmare day and night. From our first conversation, when the phone shook in my hand at the sound of the blast, I knew the depth and fear of war. For weeks, I barely slept; I cried constantly. And I prayed. Every morning, every night. In the middle of the day, at the darkest moments of the night, I prayed. And I cursed the Palestinians. I did. I cursed them for firing countless rockets on our cities; for firing missiles over my son’s head. But most of all, I cursed them for not realizing that they are the obstacles to peace. That we could be good neighbors if they allowed it. We fly all over the world helping other nations, why wouldn’t we help our closest neighbors if they weren’t trying to murder us? Perhaps one reason why there is no peace is because Israel has failed to do one thing. We have beaten them back many times, but we have never defeated them. Why? If you ask the Palestinians, they will say it is because we can’t. But we all know that is nonsense. Without question, we have the most sophisticated army in the Middle East. And yes, we could cripple them, restrain them, devastate everything. Over a decade ago, my oldest son was sent to fight in a war with Gaza…twice. When it ended the first time, I drove down to pick him up and bring him home. He could have come home on his own (as he did the second time he went to war), but I needed to see him, see that he was okay both physically and mentally. It was his first experience with war and in all the ways that counted, it was mine as well. Somehow, I managed to drive over an hour and still get to the meeting point before him. That simple. We’ve never finished what we need to do in Gaza to end the threat. Last week, the Gazan leadership went to Egypt. How did they get there? They got in their cars and drove. Despite what the ill-informed human rights workers would have you believe, Gaza has two doors, not one. If Gaza is under blockade, it is because the Egyptians have willed it. What we need to do, is close the crossings to Gaza permanently. 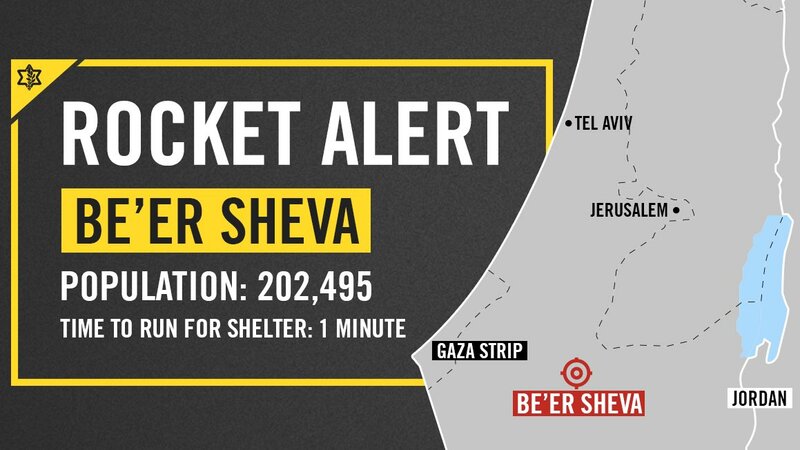 If you look at the targets of the Gaza rocket fire over the last 24 hours, you will see that numerous mortars and rockets were fired at Keren Shalom and Erez. If these are targets of the Palestinians, they clearly have no respect for the hundreds of trucks shipped into Gaza through these crossings every day. Stop the aid. Tell the Egyptians to open the doors to Gaza and supply whatever is needed. In what world is one country at war with another expected to supply them with food and water and electricity and medicine, cars and more. Stop ALL products from entering through Israel and build a wall high enough and deep enough that each side will feel they have reached the end of the world. Families in Israel that have relatives in Gaza can do what most Israelis do when they want to visit relatives abroad. Get in a plane, fly there, and have a nice time. That is what we should do, if we can’t have peace. That is what we would do, if we didn’t lack the courage to finish what needs to be done in Gaza. So long as Gazans think they have a chance for more, they will never accept less. A people that does not shelter their loved ones in time of war, cannot be expected to cherish those lives. My son told me of a young child that was killed during the war he fought. The young boy was playing near a school when the IDF shot at a rocket launching site nearby. “Why was he there playing on a day when there was no school? In the middle of war?” my son asked. I have no answer. What kind of parents allow a child to play outside, unaccompanied and alone in the middle of a war? The answer is the same kind of parents who would take their child to violent protests on an enemy’s border. And yes, the same kind of parent who would raise a child to suicide and martyrdom. In the culture of Gaza, Israel is the aggressor. That’s right, we are guilty of hitting back…first. Their operatives (terrorists, gunmen, whatever) fired on Israeli soldiers. Israeli forces responded by wiping out the observatory tower from which they fired. That seems to be a proportional, rational, and military response. 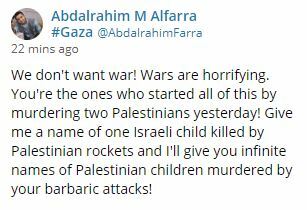 In a dialog with a young Gazan, I am told that we started this latest round by “murdering two Palestinians”. Is it really murder if they fired first? He tells me that we have murdered Palestinian children and he can give me “infinite names” and challenges me to “give me a name of one Israeli child killed by Palestinian rockets”. I responded immediately with the name of precious Daniel Tragerman. Daniel was murdered by Palestinians four years ago…he was only four. Needless to say, I am still waiting for the list of “infinite names”. Hamas responded by firing dozens of rockets into civilian areas in Israel. In what world is that acceptable? Proportional? Logical? Abdalrahim insists that the two Palestinians were innocently shooting at something on the ground. The only response I could give to that claim is that it is an admission of such stupidity one wonders how the two men even remembered to breathe. Would it not seem obvious during high tensions (basically a war), that you would not stand, facing your enemy, and shoot in their direction? EVEN IF…EVEN IF these men were shooting at the ground, the video shows they were clearly facing the border and firing a gun of some type. Abdalrahim believes Israelis should have taken the time to determine the make and model of the gun and further, one wonders how he knows what type of guns these men were “playing” with…in the middle of a war, right on the border. Our mistake, perhaps, is in speaking to someone like Abdalrahim in the hopes of reaching some sort of accord. He says he is not Hamas, and yet places all the blame on Israel. Abdalrahim does not find fault with two men shooting near a tense border, nor does he blame Hamas for firing 200 rockets at Israel. How do we answer Abdalrahim and others like him? Well, we’ve tried talking. That hasn’t worked. Also, we tried negotiations. Yes, those failed. And, we’ve tried unilateral peace moves and today, Hamas uses the locations from which we voluntarily withdrew to gleefully launch rockets at our people. Perhaps it is time to try something novel and untried. Maybe we should actually defeat them. Entirely. Completely. No, I’m not speaking of mass murder or targeting innocents, but yes, a battle to the finish. A fight that ends when Hamas cries out and surrenders. When Hamas operatives are arrested and tried for the war crimes they’ve committed. When ALL tunnels are in rubble, no matter what stands above them. Let the fight stop when all Hamas training areas are plowed over and turned into soccer fields. Yes, it will take weeks of bloody battle. Had you add up all the times we’ve already gone to war and realize that each of those times, had we finished the job, we would not be where we are here today. Fight, Bibi. Fight until no soldier turns to his mother and says, “Ima, they didn’t let us finish.” Finish the job, Bibi. Or step aside and let someone else do it. This is so true… we jews think of ourselves as compassionate but that is why history repeats itself , sometimes we need to be cruel to be compassionate to ourselves and to the other side who have been stuck in “refugeeship” forever because it serves the purposes of their leaders. With the amount of funding they have been given Gaza should be the most developed area with hospitals and universities and a group of people who live well and are not desperate enough to fight families with children. Something will have to change drastically to change the war that repeats again and again because we allow it to happen. It seems evacuating gush katif started more war rather than bringing any kind of peace. Unilateral good deeds tend to end that way. Outstanding Paula . This is truth that comes from the heart . Until they want peace rather than destroy us we have no choice but destroy them . We MUST finish the job so we can live . Beloved Israelites, the IDF,IAF,INF,MOSSAD and all the Security forces of Israel, I appeal and request you ALL, “ARISE” First and foremost (MICAH 4:13) from the Strong foundation of God – the LAW COVENANT and look to MESSIAH YESHUA and Saints of the MOST HIGH GOD YAHWEH ( addressed as SON OF MAN in DANIEL 7:13-14,18,27) they are in God’s glory and great power and awaiting for your call, so call YESHUA “BLESSED IS HE THE ONE YESHUA THE MESSIAH WHO COMES IN THE NAME OF THE LORD GOD ALMIGHTY YAHWEH. WE BLESS YOU FROM THE RETURNED & RESTORED HOUSE OF ISRAEL, WE APPEAL SAVE US, SAVE US AND GIVE US SALVATION AND SUCCESS AGAINST ALL OUR ENEMIES FOR THE PRAISE, HONOUR AND GLORY OF GOD AND YOU YESHUA AND THY WORD – THE BIBLE AMEN. I am a ardent supporter of Israel. I have friends and relatives in Israel. I completely agree with you. Finish the job. I’m sitting here with tears streaming down my face. You are 100% right. So why am I crying? Because nobody in the government is listening. Because come September more of my Sderot pupils will be post trauma. Because after Amud Anan and Cast Lead I said aloud the same words your brave wonderful son said. Because all of this could come to an end if those in the Knesset cared more about the South than they do about keeping their seats. If Knesset members had half the backbone of those getting rocketed in Sderot, a solution WOULD BE FOUND! THE JOB WOULD BE FINISHED! I’m still crying because nothing has been gained from this week of worry and sleepless nights. Oh Paula, you always express what my heart feels in the most eloquent way! May Hashem bless you and may you continue writing as brilliantly as you do. May Hashem grant that we have a Chodesh Tov. May HE guard our IDF heroes and those in the south who our government has more or less abandoned.